I'm not being dramatic when I say that the only things more difficult than choosing the perfect gift is giving birth or trying to peel a mango with wet hands. On a more serious note, buying the right gift is even more difficult when you’re doing it for those who desperately need money. Is it better to just give money to those struggling through a financial crisis? Are there gifts that can help someone on their path to financial freedom? Would it be rude to give a gift that draws attention to someone’s financial situation? I decided to ask a network of financial experts for some advice on the best gifts for friends and family who are struggling financially. Should I give money as a gift? The majority of financial experts I questioned (about 95 percent) did not like the idea of giving struggling debtors cash as a holiday gift. Instead, they suggested books on finance, financial wellness programs, and budgeting tools. I prefer compromises between a stack of books on finance and $100 cash. However, the gift should match the person who receives it. You must answer one question: does the person you’re shopping for need money, financial education, or simple, sincere emotional support? 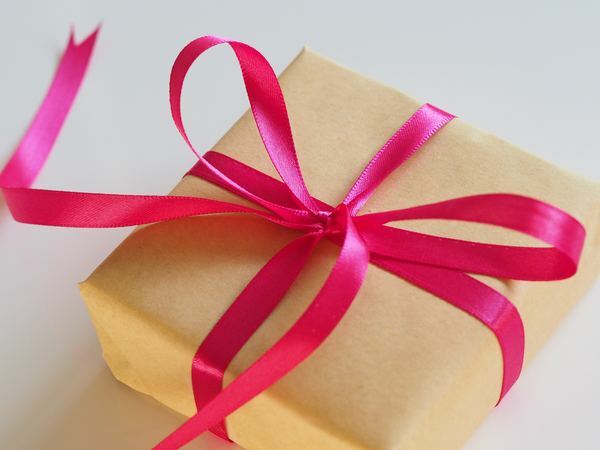 I’ve split this article, and the gift ideas, into three separate categories: Money-Centric Gifts, Education-Centric Gifts, and Support-Centric Gifts. Cash-centric gifts are all about giving the person what they want most. Education-centric gifts are about “teaching a man to fish, feed him forever.” And finally — my favorite type of gift for the financially oppressed — support-centric gifts provide a balm to the stresses of poverty. When viewed in these categories, you can see why experts would prefer education and family would prefer support. My personal favorite is #14, which is a brand-new anxiety-tracking wristband available December 1, 2018 for purchase from Airo Health. In the end though, the choice is up to you. Jim Angleton, President of Aegis FinServ Corp. The beauty of this card is that it allows for monitored spending — perfect for parents who want to keep an eye on their kid’s spending habits while they’re away at college. You would most likely only want to gift this to a close relative or one of your children. “AegisFS is a prepaid and debit card company and provides cash conveyance cards plus spending programs for students, financially strapped individuals and struggling business startups. We offer a very good prepaid debit card that can be used as a gift card or cash card. We routinely see parents who have irresponsible students in college provide these cards. It allows them to view the account balances, spending, and pie-chart showing where their money goes. Additionally we allow “topping-off” which essentially credits the card with more money. Homeless people are often provided these same cards from charities and place a certain amount but add restrictions whereby you cannot use the card for alcohol, baseless food snacks or beer/wine or non-medical items. “If someone is in debt and is struggling to get out, it might be because they are simply bad with finances. Giving them straight up cash or even gift cards may not be the best of help as it could be gone within a day without any positive impact on tackling their debt. It's sort of like give them a fish they'll eat for a day, teach them how and they'll eat for a lifetime. We want to help teach, or at least guide them, to fish for themselves. Could you expand on the idea behind stocks/bonds/CD? What do you think the best subscription gift would be? My favorite subscription I'd gift to someone with no strong financial basis would probably be Acorns. It invests your spare change and is only a couple of dollars per month. It makes for a great gift that won't break the bank and can really prove to be useful for whoever receives the gift. “If you want to give someone a tool to help them with their finances, start with a bookkeeping tool like Quicken. Quicken allows you to track all of your income and expenses so you can see where every penny goes each month. By tracking and reviewing your expenses, you can see quickly how you may need to change spending patterns to help stop the bleeding." “The number one gift I give people is a copy of Dave Ramsey's book The Total Money Makeover. If they are already working the plan, I like to give gift cards for something they want but won't buy for themselves at the moment. What’s the most important financial lesson you learned from this book? “Oftentimes those who are in a lot of debt have a bad relationship with money. With that, giving money to a person in debt to try to solve the problem isn’t likely to solve the larger problem. Those who struggle with budgeting money need guidance and a plan. Dave Ramsey is well-known in this space for laying out a very straightforward plan to help people get and stay out of debt. “Consider gifting a personal finance tool kit with a variety of worksheets for budgeting, saving, and debt repayment, a stack of finance books, or even a debt repayment coloring chart (they’ve been trending this year)! You might take it a step further and cover the cost of consultation with a financial planner — though nonprofit credit counseling agencies provide much of the same advice for free. “The best gifts depend on the debts and how they were acquired (overspending, versus some unforeseeable life tragedy that couldn’t be insured against or planned for), and depends on your own personal financial situation and ability to help. If it’s a friend — particularly one who struggles with overspending, sometimes the best gifts can be the gift of quality time together, in a fun, but inexpensive or free setting. Maybe establish a no-gifts rule this year, so they don’t feel obliged to give you something, and invite them over for a barbecue, a picnic, or a board games night, or movie marathon. How would you gift to someone suffering from a tragedy? “I think that the best gift is real support that is well organized and long lasting. What that could look like is reaching out to your network of people on their behalf, and speaking to key contacts and experts to connect them with resources and organizations that can help. It could be organizing a meal chain (where a bunch of people commit to cooking and delivering meal that can be put in the freezer or fridge) on their behalf. Child care is a huge one — organizing a rotation schedule of child care among trusted friends and family, orchestrating a community of people to help rebuild or repair. Maybe it means offering them a place to stay if the situation is so dire that they’ve lost their home. The connecting thread in all of these is emotional support and community. So often, when people hear of a tragic situation, they will say, ‘Please let me know if I can help’, but the person suffering doesn’t reach out. “Assuming the gifter has good credit, the best gift you could give them would be putting them on a credit card or two or three as an "Authorized User." Of course, you don't give them the credit card to use but just adding them as an AU will help them establish and/or re-establish credit. “The most creative way to gift someone who is debt is offering to cosign with them for any loan that they need help obtaining. There is an immense amount of relief that is given to the borrower when they have a cosigner signing with them. The borrower’s interest rate on the loan will drop significantly from when applying for a loan themselves. Also, offering to be a cosigner with someone allows for a more likely chance to get approved for a loan. This is a gift that also keeps on giving; a cosigner can arrange for themselves to be released from the cosigning responsibilities after a certain point. Most lenders will advise borrowers to not take this option, but it doesn’t hurt to request this option. Cosigning with someone in debt is risky, but it will help them out substantially in the long run. Potential cosigners should set up a strict payment schedule with their borrowers. People offering to cosign with should be invested enough to set up email notifications to know that payments have been paid on time. “Airo sits on your wrist and tracks your anxiety. It is like a therapist following you everywhere you go and making sure you know when anxiety is starting to take over. This is important because only then you know when exactly to practice your coping mechanisms.